Reduce the risk of human error or systems failure. Keep your projects on target and profitable by monitoring live progress and resourcing. 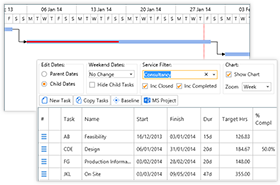 Set-up reports and templates on implementation so that your project team are tracking consistently and in the same way. On-demand reporting as you require. Track ongoing costs and hours for each project with graphical indicators such as traffic light alerts, allowing visibility of your overall project cost and resource. Manage a mix of percentage fees, fixed fees, time-charges and non-chargeable tasks on the same project. Timemaster customers deliver 85% of their projects on-time by making better decisions about which resources are available and capable of completing a project against a build industry average of 74%.